This horse halter is made from leather and is padded at 1''. 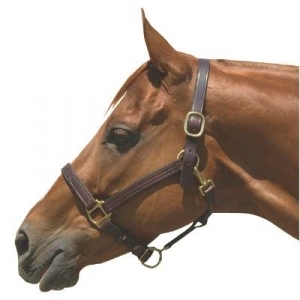 The halter has a reliable breakaway nose and single ply crown. The triple stitched padded leather horse halter comes with double ply cheeks and is triple stitched. As you can see in the product image above the top quality craftsmanship and luxurious design of this leather halter makes this an uneatable deal for the quality you will get. To top it all off the halter has a reliable snap at the throat and is adorned with solid brass hardware. We have an extensive variety of turnout halters, leather, nylon and poly halters and more on sale now at economical pricing. Comes with one adjustable crown buckle.